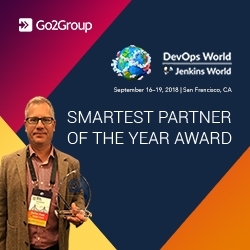 Bel Air, MD, September 24, 2018 --(PR.com)-- Go2Group, a global provider of IT delivery solutions and DevOps implementation products and services, is the proud recipient of "The Smartest Partner of the Year" award in the recently concluded DevOpsWorld | JenkinsWorld 2018 event at the Marriott Marquis in San Francisco, CA. The annual DevOps World | Jenkins World Awards is a joint effort of the Jenkins project, the community of practitioners using Jenkins, and CloudBees, the hub of enterprise Jenkins® and DevOps — and 2018 is its second year since inception. Mike Maheu, VP Engineering & Strategy, received the "Smartest Partner of the Year" award on behalf of Go2Group for having successfully completed the most number of certifications and training for Jenkins within a year. “CloudBees is an important part of our DevOps story. We have a strong and dedicated team of trained and certified technical consultants with proven expertise in both DevOps as a domain and CloudBees as the technology to support it. It’s our mission to help our customers accelerate their transformation to adopt DevOps principles and methodologies. Ourteam has worked hard to represent CloudBees’ full suite of Agile and DevOps solutions to customers in the best way possible," said Mike Maheu. As a CloudBees Vista Channel Partner, Go2Group is committed to helping enterprises optimize and transform their DevOps practices by accelerating adoption and returning value to the business more quickly. Go2Group's offerings also include DevOps consulting and training, DevSecOps, integration, cloud hosting, and more. Catch a sneak peek of all the fun we had at DevOps World | Jenkins World 2018. For more information, contact Go2Group's marketing communication team. Join the conversation at #DevOpsMatters.